Part of the crunch I’m aiming to work on over the next few days is to do some outlining for the remaining half-ish of my thesis novel. Which is why I’m sharing this, today… it’s a recent post from Magical Words that touches on this, and even gives a slightly different spin from what I’ve usually read. … uses a three act structure which she breaks down into four sections (she separates the second act into two parts). 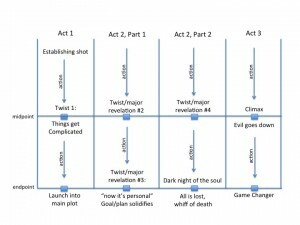 Each section has a midpoint and an endpoint and each of those points should be a “Holy &*#%$!” moment — some kind of game changer that drives the plot in a new direction. This creates a series of mini-arcs between each point — action that connects the dots. This entry was posted on May 7, 2013, 16:43 and is filed under Writing. You can follow any responses to this entry through RSS 2.0. Both comments and pings are currently closed.